Texas Book Festival took place October 29 - 30, 2005 in Austin, TX, and featured some well known authors like Lemony Snicket and Salman Rushdie. 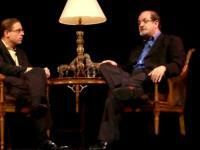 I went to see Salman Rushdie being interviewed by Evan Smith. Among the topics touched upon at the interview there was the inevitable topic of what Rushdie euphemistically referred to as the publicity agency from Tehran", writerly quirks (where do characters' names come from? ), which parts of his books are autobiographical; in the Q&A session he gave an advice to an ex-Muslim woman who said her life would be in danger if she publishes a book on Al Qaeda she has written; what could be done to help Americans understand Muslim world, and vice versa; literary criticism summed up in a word "jump", and other things.